Below are our most Frequently Asked Questions (FAQ). If you have further concerns, please contact the center closest to you and we will be happy to answer any questions. Most likely yes. Federally mandated health care laws present daily challenges to the health care industry, as such it is difficult for us to provide an exhaustive list. At the bottom of this page is our most recent list, feel free to click on the image and download the pdf file. Do I need a prescription from my doctor to receive therapy? No, Michigan is a Direct Assess State. Click here to visit the American Physical Therapy Association website to learn more about Direct Access. Please wear comfortable lose fitting clothes for moving around with, and at the same time will not expose you when you are in a variety of positions. What if something comes up at the last minute just before my scheduled appointment? We understand that life happens, please call us as soon as possible so we can make alternate arrangements and keep you on track with your plan. Plymouth Physical Therapy Specialist is committed to the highest level of patient care, including the most up-to-date treatment approaches, state of the art equipment, and same day appointments. 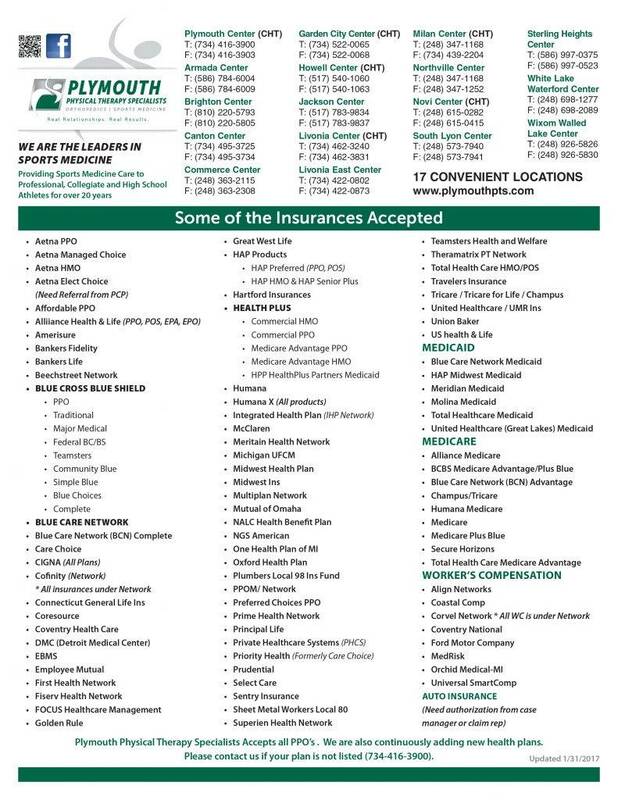 For any questions or additional information, please contact our Plymouth Center at (734) 404-7458, or visit one of our centers. Below is our most recent insurance list, and some common insurance terms.